Pic As expected, RIM today unveiled its much-delayed QNX-powered smartphone operating system, BlackBerry OS 10, along with two new handsets. The Canadian company also changed its name from Research In Motion to BlackBerry along the way. The first device out of the blocks is a Z10 touchscreen phone with no front buttons, a 1280x768 4.2inch screen at 356ppi, 8MP and 2MP cameras, and a 1800mAh removable battery promising 10 hours of talk time. It supports 4G mobile broadband (such as that provided by EE in the UK), NFC, n-spec Wi-Fi, a microSD card slot and mini-HDMI output. Weighing 135g it won't tear a hole in your trouser pocket. The second handset revealed at today's launch event, the Q10, has a conventional physical QWERTY keyboard with a 720x720 pixel 3.1in screen at 330pi. The RIM BlackBerry comeback is predicated on software, built on the embedded microkernel OS QNX that's been in cars, nuclear power plants and elsewhere; it's a very strong design we described as "brutally utilitarian" when we saw it last year. The new BlackBerrys sport a card-based user-interface design, similar to WebOS, that's based around a messaging hub. BB10 has an iPhone-Android-like grid of applications, but the system is so well thought-out it's rarely needed. In your humble writer's opinion, it all works rather well, and is allied to a clever onscreen keyboard that provides probably the best messaging and keyboard combination on a mobile. One feature not seen until today was BlackBerry Messenger video-calling with screen sharing. Another is system-wide metadata, so any application can access Evernote's tags or Outlook notes. BlackBerry has worked hard to fill in the gaps in BB OS 10's third-party software catalogue. Some notable absentees - such as Angry Birds, Skype, Amazon Kindle, and SAP - are promised to turn up eventually as developers are said to be "committed" to the platform. 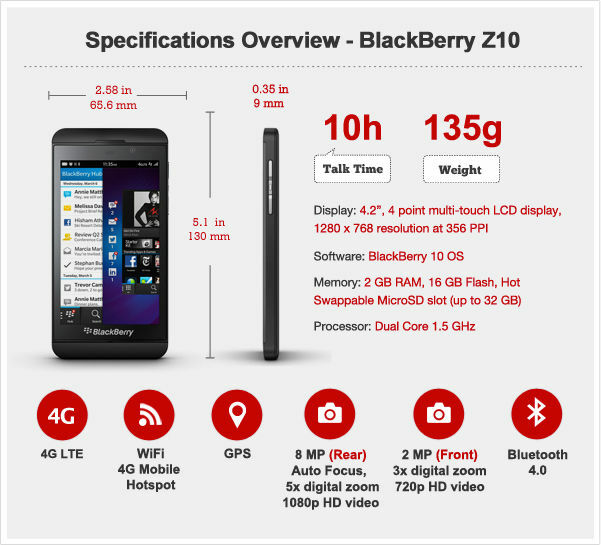 RIM BlackBerry said the Z10 will be available right away. There's strong carrier support for BlackBerry; operators are fearful of an Apple-Android duopoly but nervous about the lack of demand for Windows Phone. The Z10 gets support from all four major US carriers and all five UK networks; Carphone Warehouse and Phones4U have stock available in the UK tomorrow. Canada is a week behind.